After years of following leads and contacting travel/expedition companies, it looks as if I’ll be lecturing next year on some cruises to Antarctica and the Falkland Islands, which has always been a great dream of mine. It will be great fun lecturing on cruises again (I’ve done it four times), as the audiences are always much more receptive and interested than are the students in a regular college course. And I can’t wait to see the scenery and, especially, the wildlife. And maybe a blue iceberg! 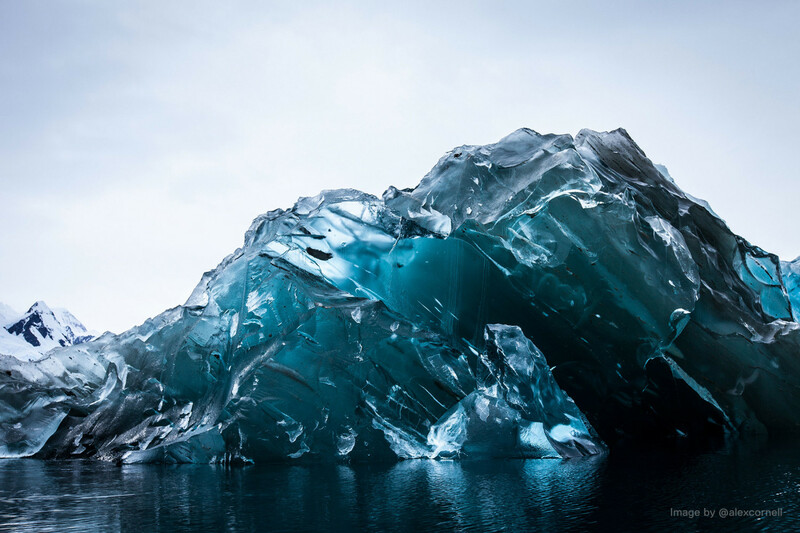 While on an expedition in Antarctica, interface designer and filmmaker Alex Cornell was treated to the rare sight of a massive iceberg that had recently flipped over, revealing an extraordinarily vivid blue underside. With the strikingly polished ice ranging in hue from light aqua to dark teal to near-black, this breathtaking specimen looks “more like a galactic artifact than anything terrestrial,” according to Cornell in a discussion with Fstoppers. Icebergs are normally white because of the air bubbles trapped inside, Jan Lieser, a marine glaciologist at the Antarctic Climate & Ecosystems Co-operative Research Center in Tasmania, tells the Sydney Morning Herald. The deep blue color of this iceberg indicates virtually no air inclusion, most likely as a result of pressure from accumulating snow squeezing out all the air. What we see of an iceberg is only about 10 percent of its entirety, with the majority of the mass hidden beneath the surface of the water. Dr. Lieser explains, “While the iceberg is in the water it actually melts, so that balance becomes imbalanced and, at some stage, which nobody can really predict, these icebergs flip and turn.” Those flips, which are extraordinary to witness, are even powerful enough to sometimes create tsunami-like conditions. Cornell’s video of the flipped iceberg, explaining how he made the photos. Yes, he manipulated them, but he didn’t make them appear blue, as you can see in the video itself. Rather, he tried to reproduce what he actually saw with his eyes. 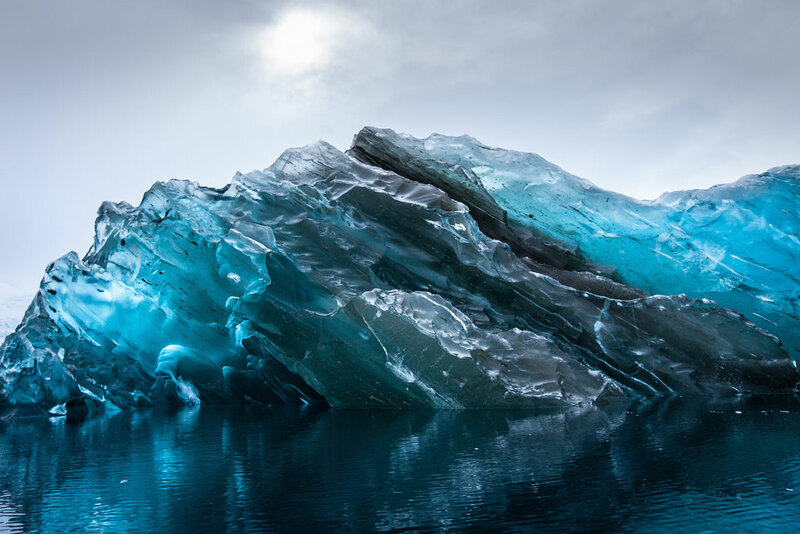 The underside of icebergs can vary in colour from blue to green and jade. “This iceberg will remain this colour for the rest of its life. How long that will be, I don’t know, but this ice will be as blue as it is until it’s melted in the ocean – unless it turns again,” Dr Lieser said. I want to see a green one, too! This entry was written by whyevolutionistrue and posted on September 22, 2018 at 2:30 pm and filed under photography. Bookmark the permalink. Follow any comments here with the RSS feed for this post. Both comments and trackbacks are currently closed. Make sure your ship has good internet! I hear it can be pretty sketchy on cruise ships. Enjoy the great adventure before middle eastern businessmen start hauling Antarctic icebergs to thirsty regions of the planet. Sounds like a blast. Take lots of photos! An uneducated guess. The berg is blue due to Rayleigh scattering of light as it passes through air trapped in the ice. Yeah that would do it, icebergs have fascinated me since as child they use to float past NZ. Not so much anymore but one did come recently and there was a helicopter scramble to greet it. Omigosh! I hope you won’t have to evacuate! What a strange place to want to live. No swimming I guess. Yes and isolated… something about not liking crowds? I didn’t know about green or dark blue icebergs. How amazing! I hope you get to see those on your trips. Very cool. If you haven’t seen it, check out the largest glacier calving event ever recorded which occurred in Antarctica in 2008. Lots of blue ice. Actually, water is blue. It’s just very pale and appears to be clear in small amounts. Why was there nothing in the article to say why the iceberg is blue. Is’nt that more interesting than the fact I’ve seen a blue iceberg. I’ll leave that to you to look up. A partial answer is suggested in one of the articles.